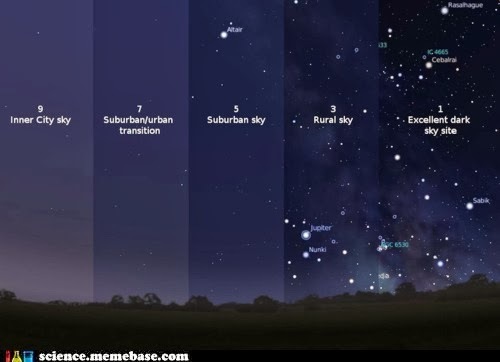 Light pollution, what exactly is it? Light pollution is the result of excessive, invasive or misdirected artificial light which disturbs the natural nighttime setting. The light emitted upwards or sideways is scattered into the atmosphere and is reflected back towards the ground. However, particles within the atmosphere which are responsible for air pollution also intensify the light pollution as it increases the amount of scatter. Light pollution is especially noticeable around urban areas across the world and can be seen as 'glowing regions' from a satellite. The light pollution from the city of Las Vegas is so strong that it can actually be seen from space. However, according to OMG-Facts, the lights of Las Vegas that are seen from space are actually pointed upwards towards the sky and is not visible from those on Earth. This means that the energy used in powering these lights is wasted energy. Not only does light pollution limit those living in urban areas from seeing the amazing night sky filled with her bountiful stars and planets, it also affects the sleeping pattern of people. Light pollution can prevent the production of melatonin, a chemical which regulates sleeping patterns. It also affects plants and wildlife. For instance, the artificial outdoor night lights disorient migrating birds, nocturnal animals and hatching sea turtles. However, there is good news! Light pollution can be reduced and contained. Of course it is handy to see where you are going at night, so as not to have a car accident or to walk into a pole. However, containing excess artificial lights not only saves energy from being wasted but will help animals, plants, astronomers and you! One easy way to limit light pollution is by simply switching off the lights that are not in use. If you are returning late at night, try changing your existing outdoor light to a motion sensor light. You can also make a big difference to the levels of light pollution by changing the lighting fixtures. Below is the perfect example of how you can use light more efficiently by changing the direction of the light.